Want to know a little baking secret? Well here it is: this DIY Vanilla Sugar! Don’t just add sweetness, add some flavor too. Vanilla Sugar is every baker’s secret weapon, and for good reason. 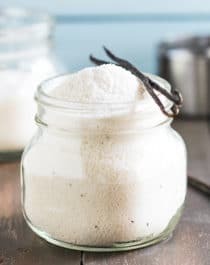 Just like DIY Vanilla Paste, this DIY Vanilla Sugar is an ingredient that will set you apart from all the other bakers out there. This will make your cakes, cupcakes, cookies, and muffins that much better than the competition. But this DIY Vanilla Sugar has a secret… it’s healthy. It has just a fraction of the calories and carbs as regular sugar, and it tastes better too. Add this to your coffee, sprinkle some in your tea, or use it as a 1:1 replacement for sugar in baking! Who doesn’t want a more flavorful baked good?? Vanilla Sugar is every baker’s SECRET WEAPON! But I’ll let you in on MY secret: this Healthy DIY Vanilla Sugar! It has far fewer calories and carbs than regular Vanilla Sugar for the same great taste. It’s sugar free, nearly calorie free, gluten free, and vegan too! Put the erythritol in a large, airtight container. Slice the vanilla beans in half, lengthwise. Scrape the beans out with the dull edge of the knife and add to the container with the erythritol. Place the vanilla bean pods in the jar as well. Seal the container and shake, shake, shake! Let sit for 1 week. Remove the vanilla bean pods and give the sugar another shake. It's now ready to use! Ummmm yes, puh-lease. An entire CUP of this Healthy DIY Vanilla Sugar has just 48 calories, while 1 cup of typical sugar has 768 calories. Can you believe that difference?! Can you believe how many calories you would save if you used this in place of regular white sugar? Not to mention, you will save yourself from a pretty dreadful sugar-rush and sugar-crash. So, make this Healthy DIY Vanilla Sugar ASAP! It’s incredibly delicious, shelf-stable, and will make everything you bake worth it’s weight in gold. Seriously. I know sweeteners like aspartame have a lot of bad effects, but do you know if there are any known problems with erythritol or sucanut? I tend to cluster all sugar substitutes together, and I figured you must have a good reason for using these, but I’d love to hear your opinion! Thanks! And sucanat is just unprocessed sugar, so it contains the natural molasses, vitamins and minerals of the sugar cane. Hope I answered your question! I’ll have to try this, if only so I can give me (slightly one-dimensional) brownie recipe a nice vanilla-y undertone! 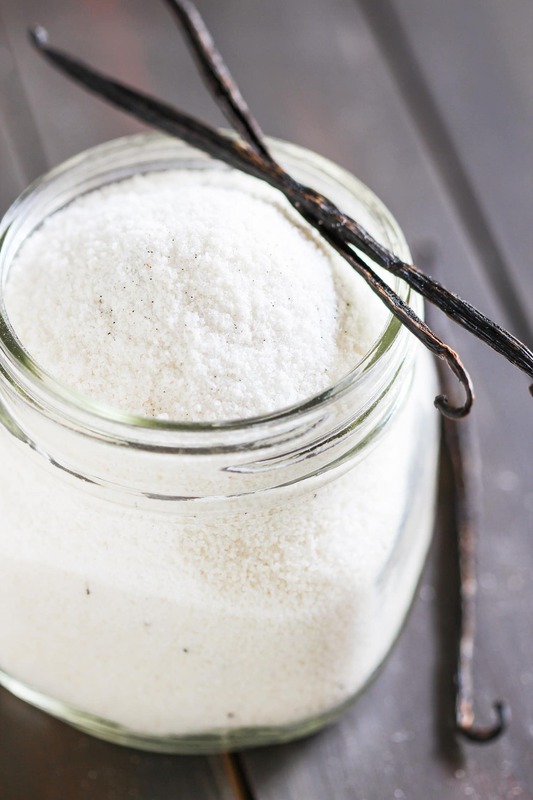 What a brilliant idea to add real vanilla beans to a natural sweetener! I still have yet to try erythritol… is it similar to xylitol? How does it compare with sugar in baked goods? PS- I am in love with those tea cups!! I’m sure vanilla powder will work! Good idea! I couldn’t find any erythritol nearby, can I just substitute it with stevia powder? Stevia powder is too concentrated and will result in a super sweet vanilla sugar. Erythritol is at a 1:1 ratio with sugar. You can try using Stevia in the Raw, but the texture will be off and might affect baked goods.